On family day and graduation day, you may shop or dine at certain establishments on the Depots without a military ID. Please see the links "Graduations: San Diego" and "Graduations: Parris Island" for specifics and where you can shop and dine. Dress comfortably and wear very comfortable walking shoes. Have a sweater or jacket for colder seasons. 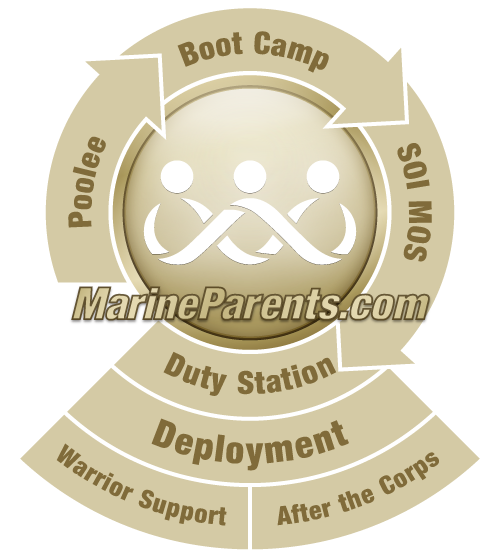 Many families wear graduation T-shirts on family day with their recruits battalion and color on it (see link to the right for Graduation T-shirts). Many prefer to dress less casually on graduation day, but that does not mean formal attire. Business casual is perfectly acceptable. Remember, you'll be sitting on the viewing stands, which are bleachers. You'll have to "climb" the bleachers, so mothers may prefer not to wear skirts, dresses or high-heeled shoes. You'll have to walk quite a bit. Dress neatly and comfortably. Bring sunscreen and use it. The viewing stands have no protection from the sun, and, even on a cloudy day, you can get sunburned. Bring a stroller for younger children. Bring a photo ID for every family member except young children. If you will be driving onto the Depot, you must have proof of vehicle registration and insurance. See the link titled "SD Base Access" or "PI Base Access" for additional information. You may take photos and videos of The Depot, the moto run, family day, the museum, the buildings, and graduation. There are areas of the Depot that are restricted access. You cannot take photos or videos in those areas nor can those areas be accessed on family day and graduation day. MCRDSD has mobility equipment rentals available. Available equipment includes strollers, wheelchairs, and electric scooters. A reservation is required for rental and you can make a reservation by calling 619-725-6270, or by completing and emailing the Mobility Equipment Rental Request Form to sandiegoservices@usmc-mccs.org. MCRDPI has a limited number of wheelchairs available for rental at the Douglas Visitors' Center, so visitors may want to bring their own. Nothing can make you ready for family day when you finally spot them in the run. Seeing them for first time in over three months. Then the next day. Your son has never been more handsome and the self pride in his every fiber is tangible. Those are moments you can not be ready for. It's too amazing. —Billie H., Proud Marine Parent from Iowa.